¬? since 1990 house prices have increased faster than both retail prices and earnings (6.8%, 4.2% and 5.3% per year, on average, respectively). 2) Agriculture fell by 16% in that period, manufacturing by 30% and tourism by 12%. Retailing fell by 1% - a sure sign that all is not well in Jersey's domestic economy. 3) Finance grew by 22%. Construction (for the finance industry) grew by 11%. What does this all say? Simply that here we have an economy that is now wholly reliant on finance and all other activities are dying. But those who lead Jersey are happy. There has been short term growth - and house prices are sky-rocketing, as are rents. 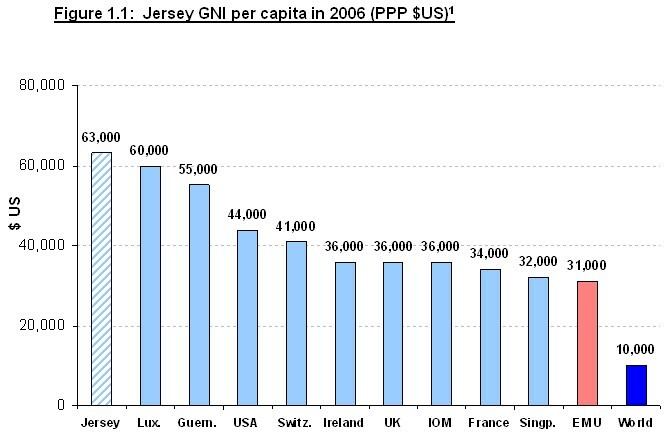 Both of which mean that the ordinary people of Jersey are finding it ever harder to live in their own jurisdiction. 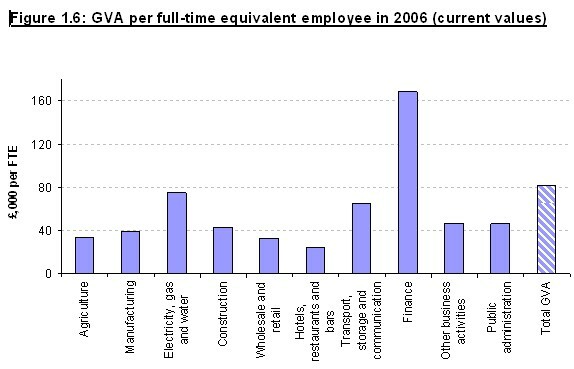 But this is no indication of wages. Profits in the finance industry were £1.3 billion out of total GVA of £3.4 billion. That profit is £103,000 per employee. That means total costs per employee amounted to about £60,000. After overheads that means many employees in this sector are being remunerated at little better than the average rate across most other sectors in the economy. This is no cause for celebration. And it means the GNI data is bogus, to put it nicely. Because all these statistics really mean is that more profits are being laundered by financial services institutions in Jersey at present than was the case over the previous year or two. And that's it. Those profits were not earned there. They were relocated there. They needn't stay there. They are simply a temporary book entry before being used elsewhere. Is the ability to launder profit something to crow about? I don't think so. And now let's look to 2008. Securitisation is dead. That knocks a massive hole in the only 'legitimate' financial services activity Jersey has. Banks are in trouble. Profits will be down. People are avoiding risk and investing in identifiable asserts in their domestic economy. Where does that leave Jersey? Dead in the water, with all its assets in a business model that is failing. A bit like Northern Rock really. But it will probably be cheaper to bail out. That's the only consolation. I just hope there's a line in the long term UK budget for doing just that - at price of a loss of quasi-independence. It will be needed, and probably sooner than I have predicted given the way the downturn will hit Jersey. It's not going to be a fun place to be in the near future.